(Newser) – Imagine you're hankering for a snack, but your refrigerator is chained up. Now imagine you're the HIV virus, and inside your fridge is the food you need to grow and spread. A new study from Northwestern Medicine and Vanderbilt University provides the chains: Researchers say they've found a way to block the virus from feeding on sugar and other nutrients in the active immune cells it invades, causing it to starve, they explain in a post at EurekAlert. By using an experimental compound to block the path to the food, researchers found the virus couldn't replicate in human cells in vitro. 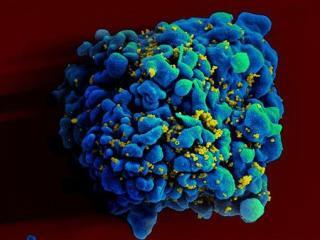 "This compound can be the precursor for something that can be used in the future as part of a cocktail to treat HIV," the study author says. You can't starve something to death that isn't alive in the first place. You can keep it from using the cell's life systems to replicate, though. Processed sugar feeds all things bad. A condom would work, too but if you want to go all out there--I guess no sugar is fine. Fine for me I've never liked sweet stuff. But--it all turns into glycogen which is just brain sugar. I have a friend who's been to twenty doctors in the last year. She had cataract surgery and she's 47. Everything hurt or bothered her and I kept saying go to an endocrinologist and test your thyroid. Well her internist did that and it was normal. But, still all the symptoms. Doctors don't do well with a hundred symptoms. They remember three from medical school. A week ago she says--how did I gain thirty pounds in one year when I have diarrhea six times a day? Well, hello should have mentioned that sooner. You have a vicious form of thyroid disease--you're hyper and hypo at the same time. The cataracts are hyper--the weight gain is hypo and your blood is stable cause they ain't taking it at ten in the night. Thyroids--they rule the world. Really. And they are all dying cause the world is getting a bit toxic. You know--canary in the coal mine?